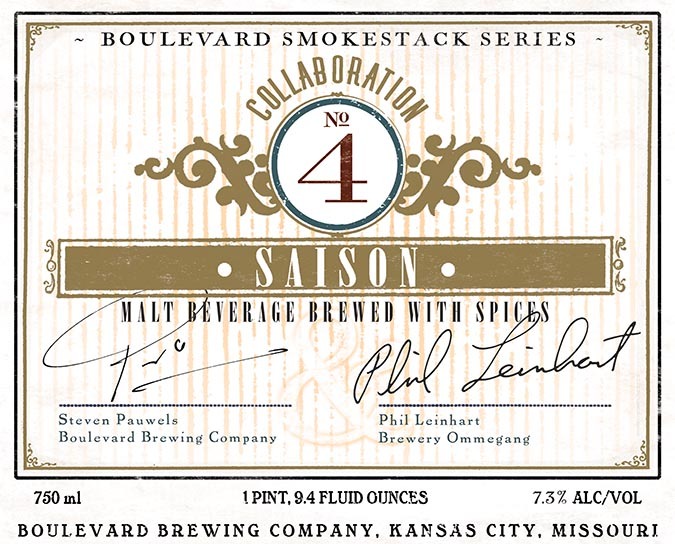 Boulevard Joins up with Brewery Ommegang for Collaboration #4 Saison! Kansas City, MO – There is no sibling rivalry between Duvel Moortgat’s US-based Boulevard Brewing Company and Brewery Ommegang. The sister craft breweries recently partnered on Boulevard’s newest edition of its Collaboration series. Collaboration No. 4 is a Spiced Saison, which will be distributed in 750mL bottles and 1/6 barrel kegs throughout Boulevard’s distribution network later this month (Kansas City distribution begins on September 22nd for draught and September 23rd for bottles; other markets to follow soon after) . Ommegang’s brewmaster Phil Leinhart traveled to Kansas City in July to make the beer alongside Steven Pauwels, brewmaster at Boulevard and his team of brewers. After the brewing process, the wort was transferred into two fermentation vessels. Boulevard’s primary Belgian yeast strain was added to one, and the other tank received Ommegang’s house yeast strain. The two batches were blended during the filtration process resulting in Collaboration No. 4. In addition to a variety of malts and hops, sweet orange peel, lemon peel, coriander and grains of paradise played key roles in the beer’s characteristics. Previous beers in Boulevard’s Collaboration series include an “Imperial Pilsner” made in 2010 with esteemed Orval brewmaster Jean-Marie Rock, a “White I.P.A.” with Deschutes in 2011, and a “Stingo” with Pretty Things Beer and Ale Project in 2012. Just picked up one of these over lunch. Gonna crack it for the Royals/A’s game tonight. Go KC! Can’t wait to watch this game!